John W. “Johnnie” Pate (born December 5, 1923, Chicago Heights, Illinois) enjoyed a notable career as a bassist from the late ‘40s up until the early '60s in the Chicago area, gaining a solid reputation as a strong player in the Oscar Pettiford mold and enlightened composer. On these 1954-1956 sessions for the Talisman and Gig labels, he leads a trio featuring Ronnell Bright, who was a swift, resourceful young pianist whose style recalls the early Oscar Peterson. With drummer Charles Walton, this bright, polished and swinging trio began to be recognized while working first at the London House and then at the Blue Note, where they were the house band in 1954-1955 accompanying great singers such as Lurlean Hunter, Ella Fitzgerald, Sarah Vaughan, Audrey Morris and Carmen McRae. With a smoothly flowing, relaxed sound, the group’s aim was to combine pleasure with stimulation, and in these terms it largely succeeded. In two tracks here, vocalist Gwen Stevens contributes delightful performances of Pate’s pretty ballad, I Was a Fool, and Don’t Worry About Me, revealing a quiet, warmly expressive voice. 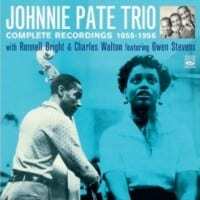 Despite his considerable experience, Pate, unlike Ronnell Bright as a pianist, never received praise commensurate with his talents as a bass player, mainly because his jazz career turned too soon to a different musical direction, when in the 1960s he became a music arranger/producer and a leading figure in the Chicago soul and pop/R&B scenes. Ronnell Bright (piano), Johnnie Pate (bass), and Charles Walton (drums). Bright, Pate & Walton (vocals on #1,11,24), Gwen Stevens (vocals on #19, 22). Tracks #21-24 were recorded during a session that took place in January 28, 1956, while the album “Subtle Sounds” was recorded the same year, some time before summer and perhaps even during the same session.